A tasty Asian-inspired dish perfect for the whole family. 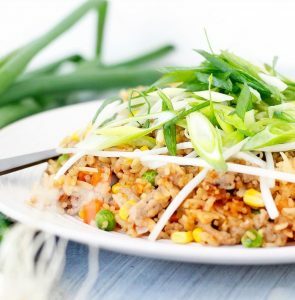 Enjoy this Chicken Fried Rice as a side dish or even on its own. Add vegetables and stir-fry for approximately five minutes. Add rice and soy sauce and toss to coat. Stir-fry for approximately 2-5 minutes until all ingredients are hot. For a gluten free option, use tamari instead of soy sauce.